The Stacer 549 Wave Runner is a great boat for people who don’t have the opportunity to wait for good conditions; it will go anywhere any time. One of the best features on Stacer cabin boats is the unique ‘walk-thru’ hatch. National Account Manager Drew Jackson says with this open lay out you don’t have to bend, curve and climb to make your way to the front of the boat, you can walk straight through. “It is a very versatile boat, an ideal size for a family, take them out fishing, skiing or for a cruise to a camping hideaway,” Mr Jackson said. The cabin provides shelter for your family, featuring a bimini and front clears as standard to keep you dry and out of the weather. Children are able to sleep in comfort on the cushioned bunks inside the cabin, and adding an optional bunk infill cushion will allow you to pull up on any island beach for a camp. Enjoy a beautiful day offshore fishing when you option up with a live bait tank, a ski pole/ cutting board and a rocket launcher and stay out longer with your 118 litre fuel tank. Explore your waterways under the comfortable ride of the 549 Wave Runner’s efficient EVO SII Hull keeping your boat stable and buoyant as it cuts through the water and planes faster. The Wave Runner’s large Mod Pod transom and gives you the ability to easily jump in and out of the boat, thus swimming, skiing, and diving or just dangling your feet in the water is a breeze. The 549 Wave Runner holds six people with level floatation and with the Mod Pod Transom, this versatile boat can support the weight of a four stroke outboard motor. 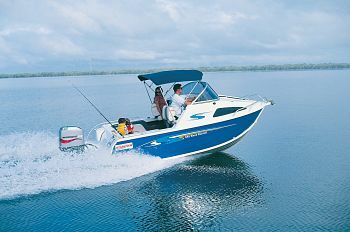 Prices start at $37,576 for a 549 Wave Runner ‘Ready 2 Go’ Package complete with motor and trailer.